(Nanowerk Spotlight) Nanostructured surfaces with special wetting properties can not only efficiently repel or attract liquids like water and oils but can also prevent formation of biofilms, ice, and other detrimental crystals. Recently, for instance, researchers have shown that it is possible to use graphene sheets to create a coating material that is very efficient at repelling water ("Extremely water repellent graphene foams "). Such ultrahydrophobic surfaces also hold the promise of significantly improving performance of condensers, which could boost the efficiency of most power plants in the world (read more: "Nanotextured surfaces - A better way to shed water"; w/video). "A critical part of designing such surfaces is 'seeing' how water and other liquids interact when in contact with them," Dr. Konrad Rykaczewski, a research scientist in MIT's Department of Mechanical Engineering, explains to Nanowerk. "Since these surfaces are made of nanostructures, we need to use an electron microscope to image these interactions." In new work, Rykaczewski and his collaborators developed a method for directly imaging such interfacial regions with previously unattainable nanoscale resolution. They report their findings in the September 28, 2012 online edition of ACS Nano ("Direct Imaging of Complex Nano- to Microscale Interfaces Involving Solid, Liquid, and Gas Phases"). The team was led by Rykaczewski and Professor Kripa K. Varanasi from MIT and included Dr. John Henry Scott and Dr. Marlon Walker from NIST, and Trevan Landin from FEI. NIST facilities were used to conduct the research, and funding came from a NSF grant and the Dupont-MIT Alliance. "In our past work, we used an Environmental Scanning Electron Microscope to look at water condensing on such surfaces" says Rykaczewski (for past research reports see here "Spatial control in the heterogeneous nucleation of water", "How nanorough is rough enough to make a surface superhydrophobic during water condensation?" and here "Methodology for Imaging Nano-to-Microscale Water Condensation Dynamics on Complex Nanostructures"). "However, the major drawback of this technique is that in almost all cases we can only look at what is happening on the outside of the drop, not below it – which is the important part." In fact, the understanding of what the cross section of a drop sitting on one of these substrate looks like is so important that almost any publication on this subject includes a pictorial schematic of what it might look like. The new method developed by the MIT/NIST team – using cryostabilization, cryogenic focused ion beam (FIB) milling, and SEM imaging (cryo-FIB/SEM) – relies on preserving of the geometry of the water drops condensed on superhydrophobic surfaces through rapid freezing in liquid nitrogen slush at -210°C. The freezing rate is so fast (about 20000°C per second) that water and other liquids do not crystallize, and their geometry is preserved in an amorphous state. The samples are subsequently transferred to a cryogenic dual beam instrument, which has a FIB column and an electron beam column oriented at 52° to each other. The ion beam is used to locally mill away part of the drop, exposing the cross section which is then imaged using the scanning electron beam (typical high resolution SEM). 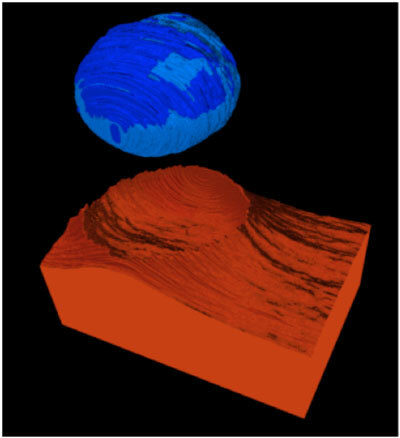 To obtain a 3-D image of the interfacial region, the ion beam is used to 'slice through' the entire drop, while an image is taken after milling of every nano-slice. So far, the team used the method to obtain 3-D nanoscale resolution quantitative information about the interfacial geometry of water condensate on superhydrophilic, superhydrophobic, and lubricant impregnated surfaces. Their current work focuses on the use of this method for developing a better fundamental understanding of interaction of liquids with such surfaces, so that their design can be improved for energy efficiency enhancement in power generation, water desalination, and HVAC applications.